One of the biggest challenges as a kindergarten teacher is teaching handwriting. If kids don’t come to kindergarten with developed fine motor skills, letter and number formation can be a very frustrating experience. I am constantly trying to find fun activities that build fine motor skills for my students. Recently I have been using Mead’s new Writing Fundamental products and have been really impressed with the activities. 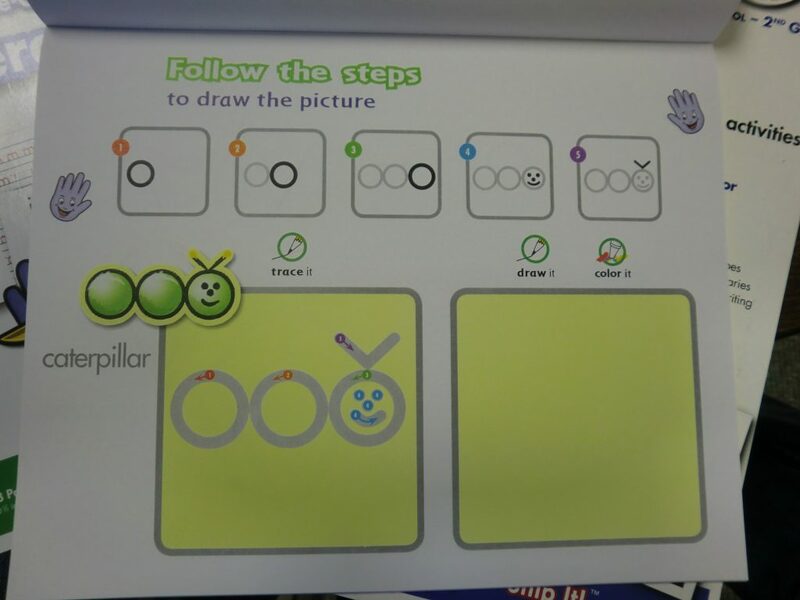 Developed in conjunction with a pediatric occupational therapist who specializes in handwriting, the line is divided into four stages based on age and developmental skills. It begins with cutting activities, dot-to-dot projects and coloring exercises that begin eye-hand coordination and fine motor skills. 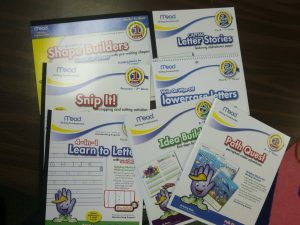 Subsequent products/stages then focus on formal handwriting instruction, including letter formation through tracing and writing practice on paper with raised lines. So many companies focus on handwriting skills instead of beginning with cutting activities. 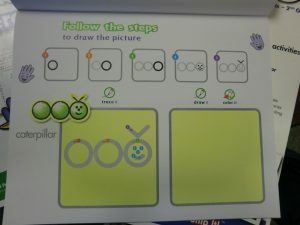 I was really glad to see a quality product produced by a quality company to address these fundamental fine-motor skills. One of my favorite items that I received from Mead is the Snip It booklet. 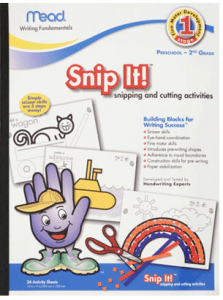 This booklet of snipping and cutting activities no only helps children master the use of scissors, but results in colorful, creative art projects with little mess. Easy-to-follow cut lines on colored paper make snips go quickly. Projects get progressively more challenging by adding shapes to pictures and then following a model. Not only will your child learn how to cut, they will learn about shapes and colors as well. If you are looking for work for your young child to do at home all of the Mead Writing Fundamentals booklets are developmentally appropriate for the youngest learners. Young children shouldn’t be expected to sit and do homework for more than 10 minutes at a time and the activities in the booklets are perfect. I wish I had a class set of these to hand out to everyone of my kindergartners. You can purchase Writing Fundamentals by Mead products ranging in price from just $3.99 to $6.99. Visit meadonline.com for more information. One (1) lucky winner will receive their choice of 5 products from Mead’s Writing Fundamentals. Visit Mead and tell me what product you would most like to try from the Writing Fundamentals product line. Open to US residents only. This giveaway will end at midnight on September 10. Winners will be picked from Random.org. Good Luck! I’d try the idea builders or letter stories. 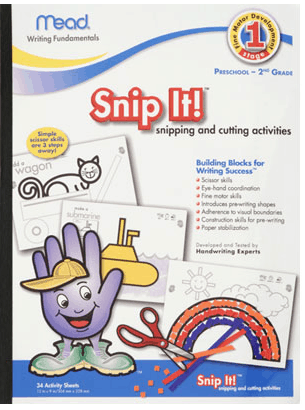 I’d like to try Capital Letter Stories™, Lowercase Letter Stories™, Number Stories™, and Snip It™. I like the Color Bound and Snip It Books! These books would all be great for my 4 year old! I would choose the “Five Star Hybrid notebinder” in blue with green flowers. I like Lean to letters. I think the tablet with the raised ruling is a great idea, so kids can feel when their pencil hits the line. I would like to have Learn to Letter with Guidelines for a student that I help tutor who was living in a refugee camp–she is in high school and doesn’t form her letters correctly. She really wants to succeed. I’d love to help her. I like the Number Stories. Like A Mom’s Impression on Facebook. how neat! I would love to try the Color Bound one, I think Taylor would love it! Thanks! I would love to try the Mead Color Bound booklet! I like the Snip It book. I’d love to try the Color Bound. I think I like the Idea Builders. I would love the letter stories one! I would like to try the Mead Idea Builders book. I would like to try Number Stories.